Small Rock Chip – Big Problem! Often drivers are lulled into a false sense of security by a small rock chip. They imagine that a small rock chip is somehow less likely to grow in to the dreaded crack that makes its way all the way across the windshield if left untreated. 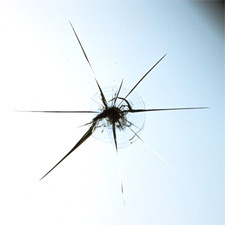 To begin with, most cracked windshields start with a small rock chip which later expands into a long crack. The crack may spread immediately, over night, or even in a matter of months to years. There is simply no way to tell when the damage is going to spread. Often customers inform me that the rock chip I am about to repair has been there for several years. I always tell them the same thing, which is that they have been on borrowed time, and very lucky at that. A rock chip may seem stable for a long time and then circumstances align causing it to suddenly break. Here’s some of the factors and physics behind what causes a rock chip to spread. Glass tends to expand and contract in the heat and the cold. Usually, the rock chip you can see with your eyes also contains several invisible micro cracks which extend further out. When the glass expands in the heat or contracts in the cold, already weakened by the impact of the rock, it may give way, cracking sometimes up to 2 feet or more. The impact of the rock hitting the windshield has removed a small piece of the surface glass, weakening the structural integrity of the windshield. Vibrations and bumps in the road can easily cause the chip to crack. Differences in atmospheric pressure can also cause a weakened windshield to crack. Often drivers report that a rock chip that had been on the windshield for months, suddenly cracked when they went into the mountains. Last, running the car heater or air conditioning can cause an unstable rock chip to crack. Like running a cold glass under hot water, or hot glass under cold water, the difference between the temperatures of the outer and inner layers of the windshield can cause the glass to shatter. The size of the rock chip is immaterial. A tiny rock chip is just as likely to crack as a larger one. The same physics behind large rock chips are in play with smaller ones. That’s why I say that drivers are often lulled into a false sense of security when they have a small rock chip. I can’t count how many times I’ve heard the same story. It always starts something like this: “I had this little rock chip on my windshield that happened a few months ago and I thought, it was no big deal. Then I came out yesterday and it had spread to over a foot long. Is there anything you can do?” And of course, the answer is, “no”. Rock chips are a pain in the neck no matter what size. My advice is to have it repaired immediately so it doesn’t become a much bigger, much more expensive, pain in the neck. This entry was posted in Helpful Tips, Windshield Repair and tagged american glass repair, auto glass repair, bulls eye, helpful tips, rock chip, rock chip repair, star break, windshield damage, windshield repair on July 30, 2016 by Paul Roth. Glass will always behave in a relatively predictable way. There are a few “enemies” of windshield repair. Extreme temperatures is one of them. Glass tends to expand in the heat and contract in the cold. The windshield is comprised of three layers, UV glass on the outside, UV glass in the interior of the car and a synthetic in the middle, laminated together to create a strong bond. When it is very hot outside, especially when the car has been sitting in direct sun, the windshield can heat up to well over 110 degrees F. More than likely, drivers will run their car air conditioner on a hot day and if there is a rock chip or a small crack on the windshield, the variance in the temperatures from the outside of the windshield and inside the car, can easily cause the damage to grow in size resulting in the need for a costly windshield replacement. Here’s why: The outer layer of glass is expanding in the heat. The middle layer is fixed, and the inside layer is contracting from the cold air blowing from the air conditioner. This causes a certain amount of pressure, and to relieve the tension, the glass cracks. It is the same principle that cause a hot glass to shatter if it is held under cold water or visa versa. In the Winter, the same thing can happen, only in reverse. The outer layer of the windshield is icy cold and when the car heater is turned up, the inside layer begins expanding with the heat. Avoid extremes in temperature. If you are still using the vehicle before you have a chance to have it repaired, try to park it in a shaded area, out of direct sunlight. Avoid using sun reflectors that are shiny. Shiny reflectors will shield the interior of the car by reflecting sunlight away, but they are also known to heat the windshield to temperatures that can easily cause a small rock chip to spread. Instead, use opaque, or satin-finished sun guards. If you are using your air conditioner, keep it on low, and keep the setting adjusted so that the air flow is focused mainly on your legs and not on the windshield. -Simple tips that can help to save your windshield. This entry was posted in Helpful Tips, Windshield Repair and tagged american glass repair, auto glass repair, bulls eye, insurance claims, Maintenance repair and operations, rock chip, rock chip repair, star break, windshield damage, windshield repair on May 30, 2016 by Paul Roth. If you’ve ever seen one of these signs advertising “Free Rock Chip Repair” you’ve probably wondered, “what’s the catch?” Actually, there is no catch. The list below represents most of the auto insurance companies that will waive your deductible if you opt for a windshield repair instead of a more costly replacement. By doing so, you are saving the insurance company from having to cover the cost of replacing your windshield. 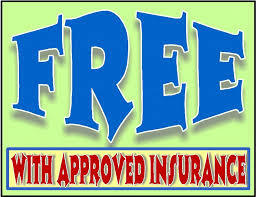 In turn, they are doing you a favor by waiving your deductible, with no impact on your premium. Most insurance companies will allow you to have up to three rock chips repaired and they will permit you to claim additional chips on subsequent claims should you have any. This entry was posted in Insurance Related Info and tagged auto glass claims, auto insurance, deductibles, free rock chip repair, insurance claims, no out of pocket cost, rock chip repair, star break, waive deductible, windshield repair on September 13, 2013 by Paul Roth. A windshield chip can crack at any time. Increased pressure could turn the chip into a crack at a moment’s notice – including while driving. Repairing a chipped windshield can take as little as 30 minutes. Windshield chip repair saves money. The cost of windshield replacement far exceeds that of repairing a chip. The longer you leave a windshield chip, the more likely it is to get worse. In cold weather conditions, windshields contract. As a result, windshield chips and dings are more likely to spread in a horizontal fashion. According to a study conducted by the Motor Industry Research Association (MIRA), chips were likely to spread more than 80% of the time at temperatures of 14 degrees (-10° C). Windshield chips tested at 32 degrees were nearly 60% likely to crack. Warm weather conditions cause windshields chips to spread into vertical cracks. The cooling effect of the air conditioning unit makes chips even more likely to crack. Driving over a speed bump, pothole or other uneven terrain can cause a windshield chip to crack. The force radiates through the car and puts additional pressure on the edges of the chip, which can quickly lead to a crack. Although it is not possible to say how long it will take for a windshield chip to spread, simply driving will eventually cause or lengthen a windshield crack. Getting a your windshield repaired early can stop the damage from spreading and prevent the need for a windshield replacement. This entry was posted in Windshield Repair and tagged mobile windshield repair, rock chip, rock chip repair, star break, windshield damage, windshield repair on September 12, 2013 by Paul Roth. You car windshield is not just “another piece of glass.” It is one of the most important vehicle safety features and the only thing between you and everything else on the road. Your windshield is comprised of 3 laminated layers. The top layer on the outside is typically UV glass as is the bottom layer, inside the car. The middle layer is soft and comprised of PVB (Polyvinyl butyral (or PVB) a resin usually used for applications that require strong binding, optical clarity, adhesion to many surfaces, toughness and flexibility. 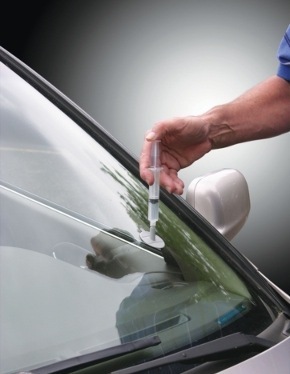 Trained windshield repair technicians inject an acrylic resin into the damaged area on your windshield using special tools and high pressure. The process involves both pressure and vacuum cycles. This is where do-it-yourself kits fall short and usually fail. Do-it yourself kits only allow for one pressure cycle. In other words, you get one shot. If it fills, you are lucky and what ever the result, you are stuck with it because once the resin is injected and cured (hardened) there is no do-over. The do-it-yourself kit does not allow for a vacuum cycle so there is not way to remove trapped dirt, debris and moisture from the damaged area. The results are usually cloudy at best and unpredictable. In short, you risk ruining your windshield to save money and in the long run, home kits lead to the need for a costly windshield replacement. While on the topic, I might also mention that attempting to repair a damaged windshield with household products, such as, Crazy Glue, and nail polish will ensure the need for a replacement windshield. There is no substitute for using a trained professional when it comes to something as significant as one of your vehicle’s most important safety features. This entry was posted in Windshield Repair and tagged do it yourself windshield repair kit, home repair kit, rock chip, rock chip repair, star break, windshield damage, windshield repair on September 11, 2013 by Paul Roth. Above is an example of windshield damage commonly known as a star. Star breaks usually have an impact point where the rock or debris has hit the windshield. The impact causes the windshield to crack forming several legs extending outward from the center. Left untreated it is not unusual for a simple star break to crack out clear across the windshield resulting in the need for a more expensive windshield replacement. Here are three photos illustrating three phases of treating a star repair. In the first photo, you can clearly see the legs extending out from the center of the break. The center photo shows a closer look after resin has been injected into the break. The legs are already filling in this photo. Approximately 15 minutes later the third photo shows almost no sign of the original damage. The entire repair took about 25 minutes to complete, leaving the windshield as strong as it was before the damage had occurred and about 90% enhanced in appearance. The customer reported this damage to her insurance company one day after it occurred and we repaired it the very next day. The sooner damage is repaired after it has occurred, the better the results. There are several reasons why time is critical. 2. The damaged windshield is missing a piece of glass where the rock hit and moisture and debris can get into the break making it more difficult to repair. This entry was posted in Windshield Repair and tagged american glass repair, mobile windshield repair, rock chip, star break, windshield repair on August 4, 2010 by Paul Roth. What Will Work & What Will Not.